This multi cache will take you on a short walk away from the chapel due to the proximity of other local caches. This is another Presbyterian foundation chapel. 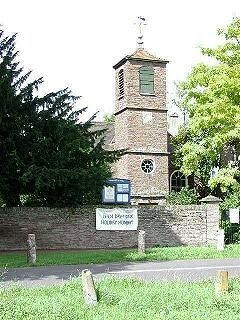 It has a unusual appearance for it’s date because of the entrance tower which is a landmark on Frenchay Common. This village has always been fiercely Non-Conformist without an Anglican church until 1834. The Quakers were the dominant force here. 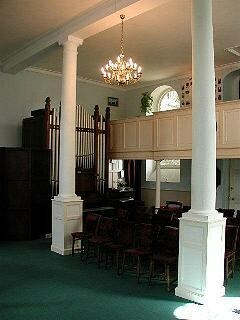 However the Presbyterian church was first on the scene in about 1760 although no one is exactly sure when. The earliest minister was Joseph Tyler. There is also a trust deed of 1691 although as the church leaflet points out it does not deal with land. However tests on the roof structure showed a date of 1680 which sounds about right. The most famous feature of the chapel is the Burial stone which was laid on to newly dug graves at the chapel to stop stooges of Bristol surgeons recovering the bodies for research purposes. It is hard to describe the style of the chapel. Although the tower is generally supposed to be newer than the main chapel structure I think it’s features are no later than early 18th cent and looks like the kind of debased vernacular which was common at that time. The tower is of three stages with a very small spirelet on top and weather vane of Haley’s comet. In the tower was a bell with the inscription “when you hear me ringing come and praise the lord recast 1750.” I guess the tower is similar to Cradley Unitarian chapel (altered 1860’s). The body of the chapel is square in plan although it has two hipped roofs. The windows below are of the circular sashed type and look like a later replacement of older windows.